If you've been to a home and garden store recently, you've probably seen silicone baking sets. Available in a wide range of sizes and colors, these sets are popular due to their nonstick nature and versatility. However, that doesn't mean they are for everyone. Silicone bake-ware, while safer than you might expect at first glance, does pose a few safety problems. With a little information, you can make the best choice for yourself and your family. Chemical contamination isn't a major issue with silicone bake-ware as it is for certain plastics. All silicone products intended for use with food must meet FDA standards. Chef Alton Brown, a Food Network star chef, reports silicone is chemically inert -- meaning it cannot react with your food -- and flameproof up to 450 degrees F, far hotter than the 300 to 375 degree F temperatures cake, muffin and cookie recipes usually call for. In some ways, silicone baking sets are far more durable than their rigid counterparts. Unlike a glass pie plate, a silicone pan won't shatter if you happen to drop it onto a hard kitchen floor. Silicone is impervious to rust and can't scratch the way metal pans sometimes do. However, repeated runs through the dishwasher can wear the markings off silicone bake-ware. You also need to be careful not to use sharp implements to remove baked goods from silicone pans, as the point of a knife can go right through them, possibly causing cuts. One possible safety issue with silicone baking sets comes from their characteristically floppy nature. This makes them difficult to grip with oven mitts or potholders. While the silicone itself does not transmit heat well, it's rather easy to bend the bake-ware and touch the 300 degree F cake or muffins. Burns aren't the only problem; since floppy silicone bake-ware doesn't contain batter as well as metal or glass, there is increased risk of spilling batters containing raw egg onto counter-tops, creating a risk for cross-contamination. If you've decided a silicone bake set isn't for you, there are many good alternatives. Disposable aluminum pie pans won't break and create dangerous shards if dropped, and with a quick spritz of nonstick spray, will release your pie easily. 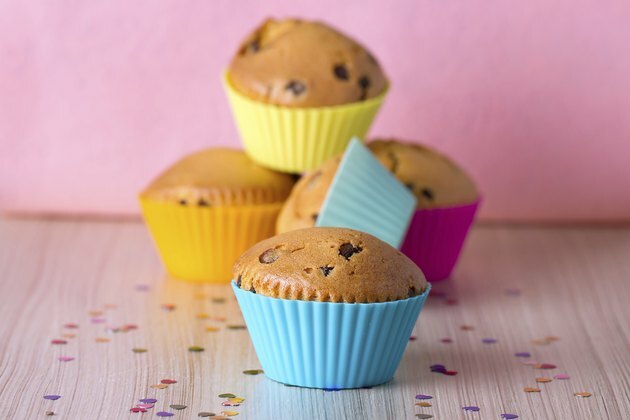 Oven-safe nonstick muffin tins, cake pans and bunt pans are available, though they may be a bit more expensive than their standard-finish counterparts. Sometimes, you don't even need a pan at all. Rustic bread dough, formed into a ball or baguette, will bake just as well on a cookie sheet as a standard loaf will in a loaf pan.